Cyclohexane is often depicted as a planar hexagon. However, with so much strain on the bonds, it prefers to adopt a chair conformation. This tutorial series will teach you everything from understanding these structures, drawing chair conformations, and ranking stability based on substituents. 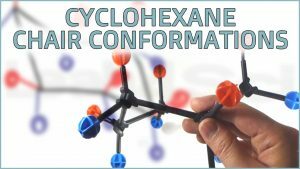 Once you feel confident with the material go ahead and try the Chair Conformations Practice Quiz! 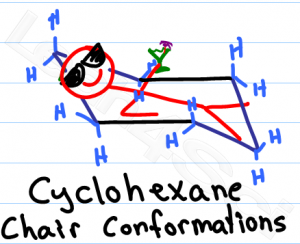 “Why does cyclohexane have to be in a chair conformation? How do I know which carbon goes up or down?” Learn this and more in video 1 of the chair conformation series. Learn how to recognize a chair, what it represents (with a model kit and on paper) and the nature of axial and equatorial substituents. Chair conformations are tricky to draw. While orgo is NOT an art class, if your substituents are ambiguous you may lose points. This tutorial shows you my step by step method for drawing a hexagon, cyclohexane chair conformation, and simple ring flip method. The focus of this tutorial is speed and simplicity to ensure maximum points and minimum wasted time/effort on your next quiz or exam. 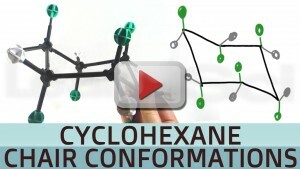 Don’t forget to test your knowledge with the Cyclohexane Chair Conformations Quiz! 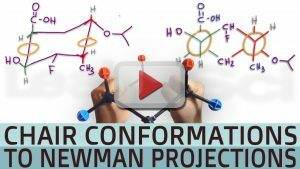 Newman Projections is another important conformational analysis topic! to see what to study next!